Experts say that millions of Indians who are below the poverty line and have no access to major financial services may gain huge benefits from mobile banking as the use of cellphones continue to increase in great numbers. 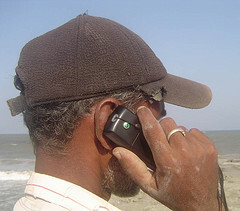 Banking thru mobile phones could transform the face of India’s rural economy. However, experts say that the industry has to first alleviate concerns regarding transaction security. Furthermore, they need to overcome limited reach in far-flung areas and low literacy rate. Amit Ahire, Ambit Capital analyst, said that the mobile banking potentials in India are huge. In a meeting Mumbai a few days ago between the banking and telecom sectors, they agreed that mobile banking is yet to be tapped. Mobile banking includes bill payments, remittances, and money transfers. In India, there are about 19 million new mobile phone subscribers each month; the world’s quickest growing market. In fact, 10% of the world’s cellphones are sold in India according to Gartner, a technology research specialist. In the country, there are around 775 million people who use mobile phones. In contrast, almost 50% of the adult population in India do not have bank accounts. If the banking and mobile phone sectors are tapped and used to their full potentials, consumers and the country’s economy will benefit greatly from it. A total of 39 banks have been given permission by the Reserve Bank of India to offer mobile banking services. They have also raised the amount limit of mobile banking transactions from 5,000 to 50,000 rupees.